Bringing your first puppy home is a memory that few people forget. It drastically changes your life for the better and you get a warm feeling knowing that it’s your dog and it’s going to be a big part of your life for the foreseeable future. 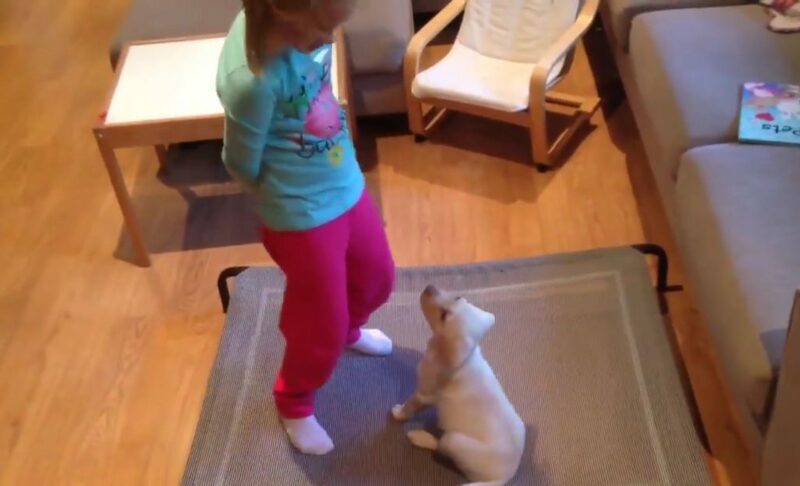 That’s exactly how one Australian family felt when they brought home their new puppy, Sasha. However, their joy was short-lived when they came home to find that their house had been burglarized and their puppy was gone. Luckily, Sasha had a secret of her own. 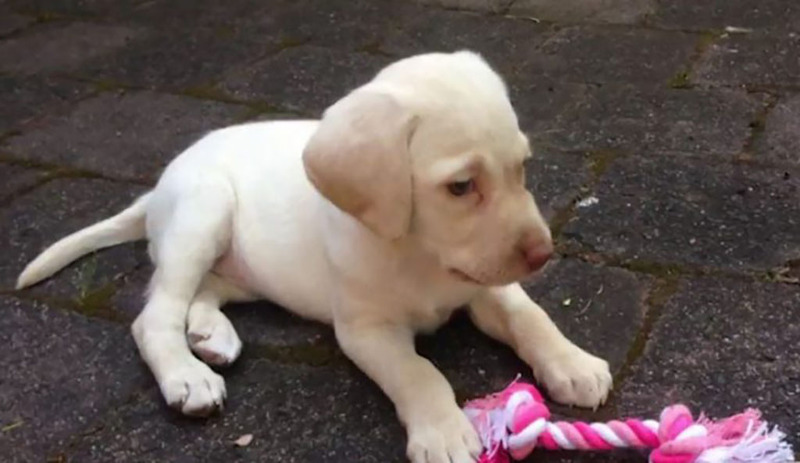 When Australia couple Ryan Hood and Elena Sardi brought home Sasha, their new yellow Labrador retriever puppy, they knew that she was a perfect match for their family. Their four-year-old daughter, Maia, thought so too. She could barely contain her excitement when the new pup finally made its way through the front doors. Their lives were about to change, and the whole family was excited about this new chapter in their lives. As soon as Sasha came through the door, it was clear that Maia and the puppy had a close connection. Being an only child, Maia sometimes felt lonely without a brother or sister, but her parents weren’t planning on adding another child to the family anytime soon. 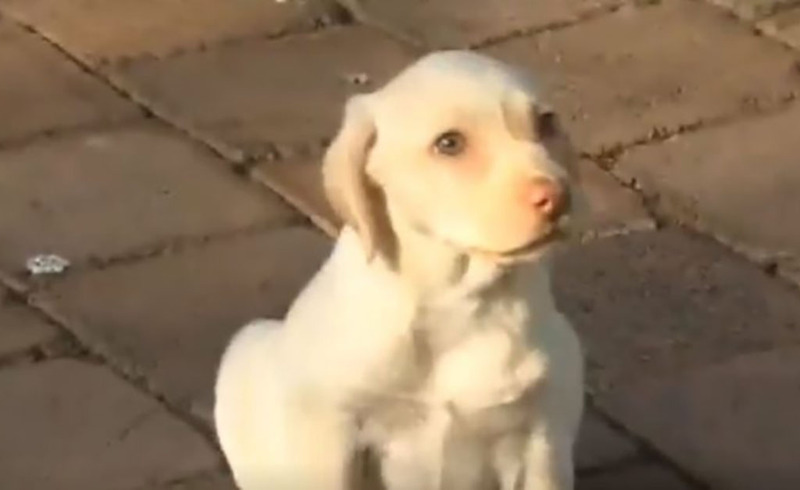 Instead, they thought getting a puppy would be good for their daughter — and it was! The family immediately felt complete with their newest member. Elena said, “We picked Sasha and she picked us.” From the moment they brought Sasha home, the puppy and their daughter Maia became inseparable and were spending every waking moment together. They formed an incredibly strong bond in a short amount of time and Maia now had a companion like she never had experienced before. This is what made it so hard when the unthinkable happened to the family just days after adopting Sasha. Then, one day, the family went together to have routine checkups by their family doctor and left their new puppy at home. Not thinking much of it except hoping that Sasha wouldn’t chew up their furniture, they felt safe leaving their new puppy behind. Unfortunately, something horrible happened, and their house was burglarized in the short time that the family was away from home. To their horror, they learned that having people break into their home wasn’t the worst of it. They returned home from the doctor’s only to discover that they had been robbed in such a short amount of time. There were clear signs of a break-in, but they didn’t know the kind of damage that had been done. The burglars took off with many of their valuables such as iPads, a laptop, jewelry, and just about anything worth of value. Yet, while this was devastating enough to them, they were about to learn that something irreplaceable had gone missing as well. 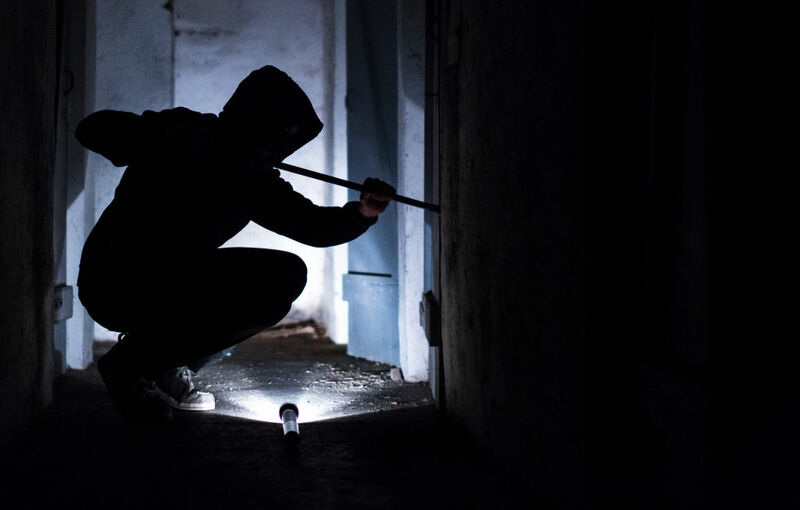 While the family was very shaken that somebody had not only been in their home, but gone through and stolen many of their belongings, that wasn’t the worst of it. They couldn’t find their innocent puppy Sasha. Everything that had been taken by the burglar had been replaceable and meaningless for the most part. However, their new dog on the other hand, was not. The family was devastated, but Maia took the loss the hardest. 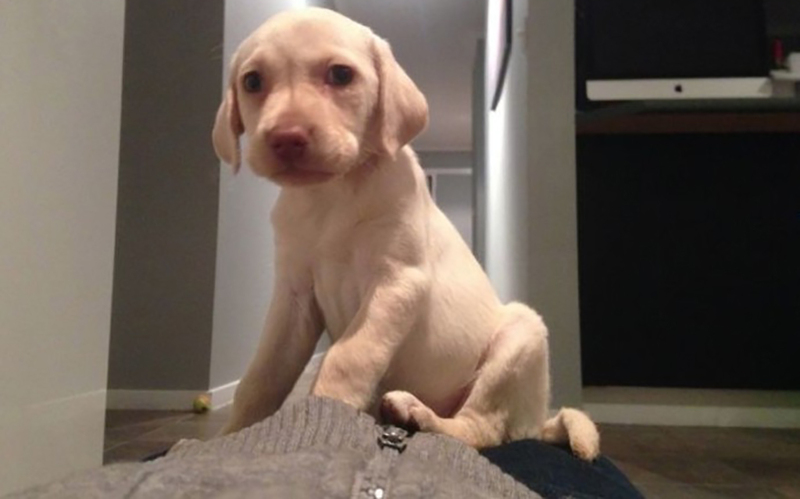 While some people, unfortunately, experience a break-in at some point in their life, not many people can claim that they’ve had their dog stolen, especially such a young puppy. Although the family had only adopted Sasha about a week before she went missing, it didn’t make losing her any less hard. 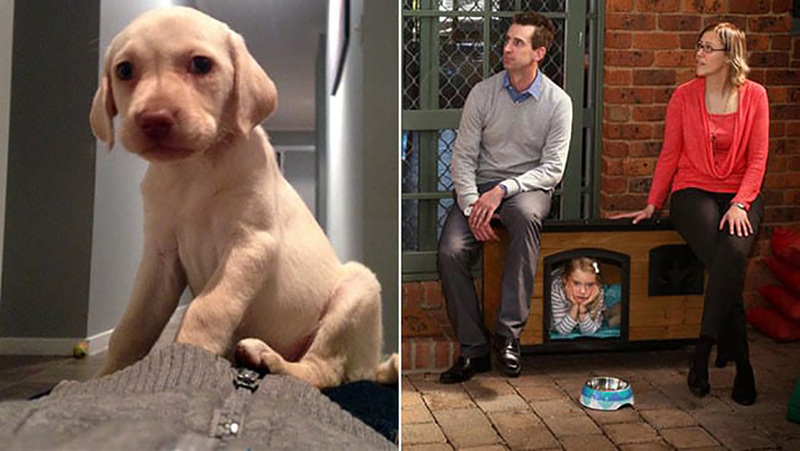 The puppy had become an instant part of the family and now a staple of their home. On top of all that, Maia had considered their new puppy to be her best friend. 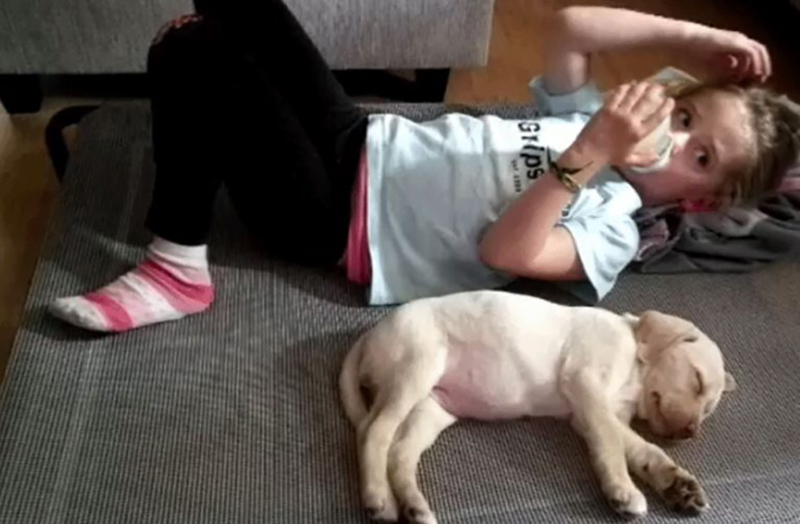 So, not only did she lose her new dog but her new friend too, something no young girl should experience. Since the family first adopted Sasha, Maia had let her sleep in her bed with her. The two had developed quite a deep bond in just the one week that they had shared together. Now, just like that, Sasha was gone and Maia didn’t know what to do about the situation. 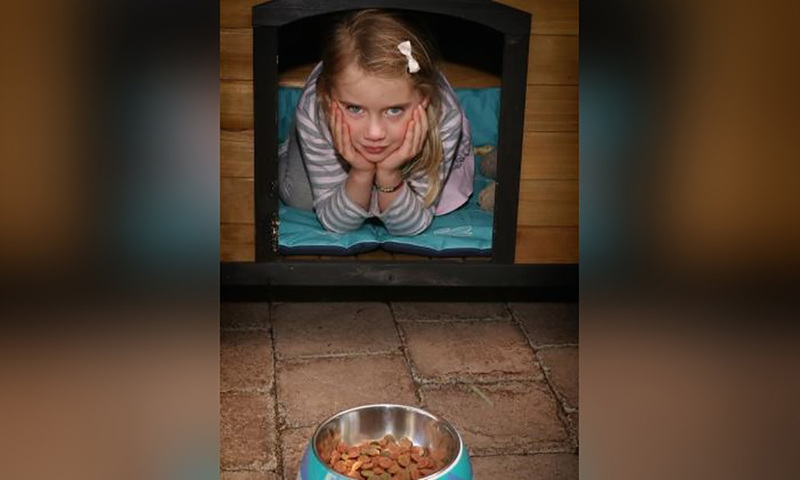 Her father, Ryan, commented, “It’s been tough, my daughter has had nightmares the first night.” All she wanted was to have her puppy back home. Trying to explain why someone stole your puppy to a child is something that no parent should have to do or young child should experience. It was clear that the whole family was affected by the terrible circumstances. While everything might have seemed to be going wrong, there was a silver lining. What the burglars didn’t know was that Sasha had a secret of her own. She had been microchipped after the family had adopted her so that she could be identified if she was ever lost and taken to a shelter. 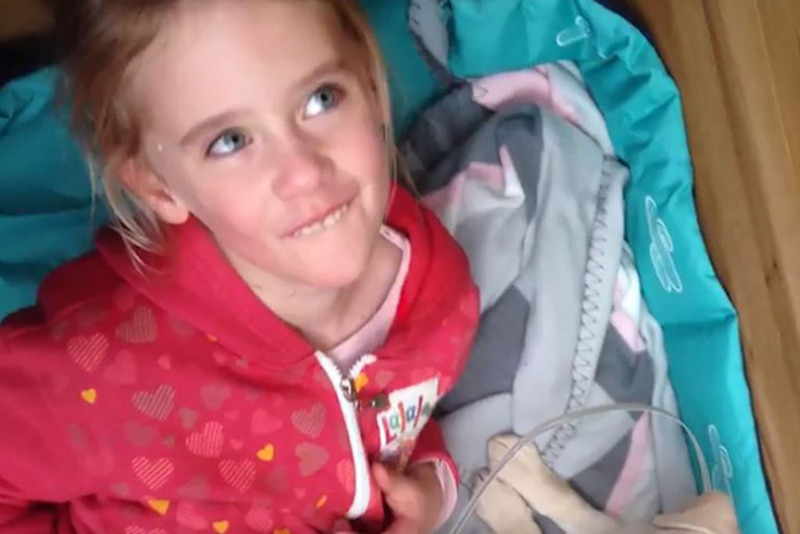 Chances are, the burglars weren’t thinking about the possibility of that when they heartlessly stole her from the family’s home and their daughter. 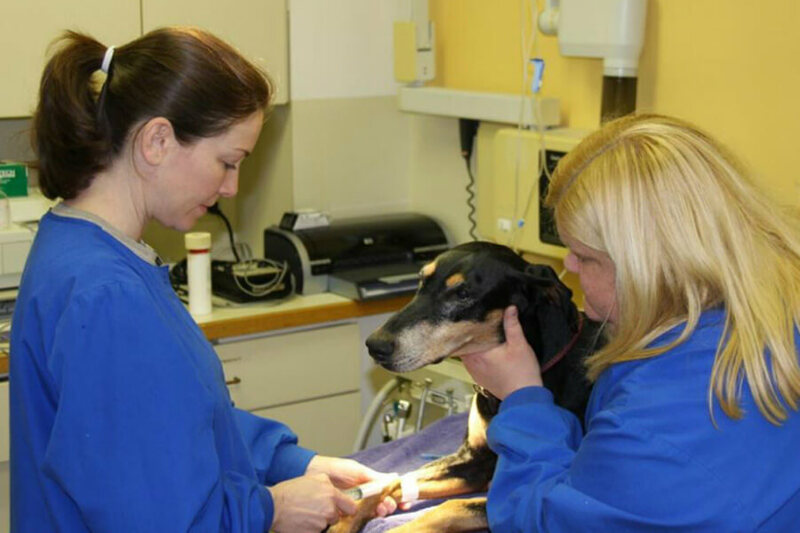 It’s always a good idea to get your dog microchipped if you have the opportunity. 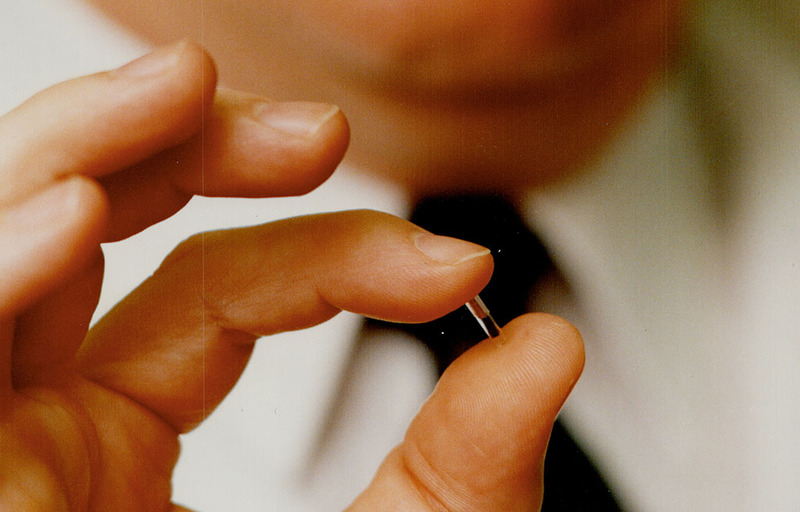 It’s a fairly inexpensive process and the microchip itself is no bigger than a grain of rice. 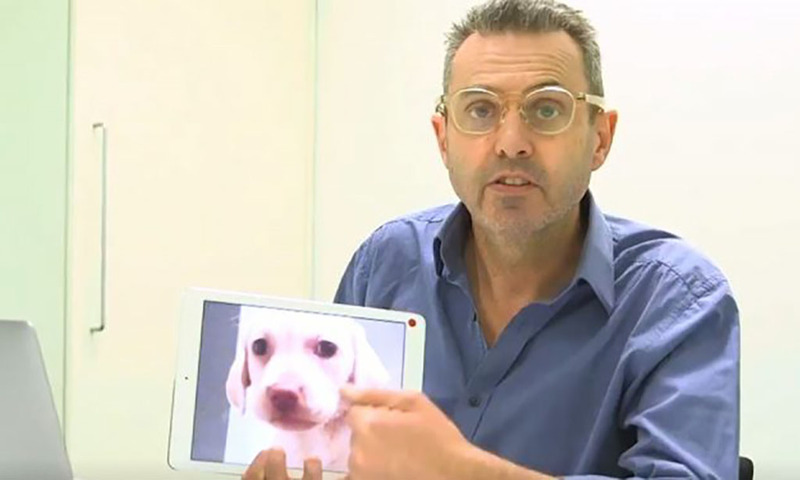 The chip is painlessly implanted in the dog’s neck and happens so fast that the dog doesn’t even know what happened. While the microchip can’t act as a GPS to locate a lost animal, it can be used to trace a dog back to its rightful owner. 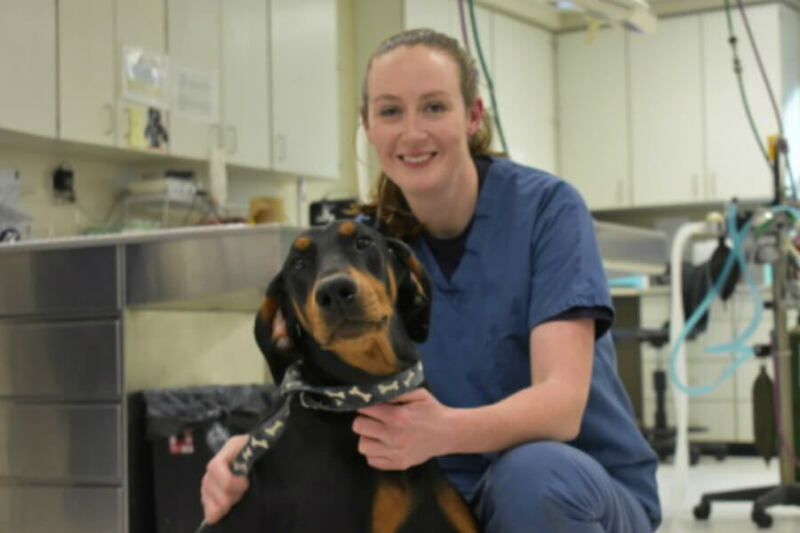 When Maia’s parents had Sasha microchipped when they first got her, Sasha was given a personalized identification number so that veterinarians or shelter volunteers would know that she has an owner. Her information would say that she belonged to the family, where her home is, and a contact number so that the family could be informed where she was. Little did they know that having Sasha microchipped would turn out to be a saving grace for their family. 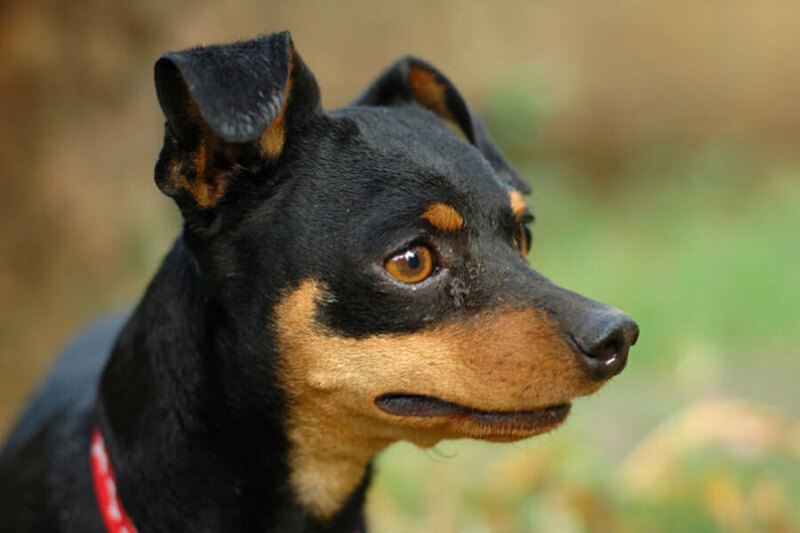 Although the microchips are incredibly small, the technology of the chip allows for detailed information such as the dog’s name, the owner’s name, the owner’s phone number, and their home address. The chips are scanned using a special device which shows all of the dog’s information in order to get the dog back to their owner. 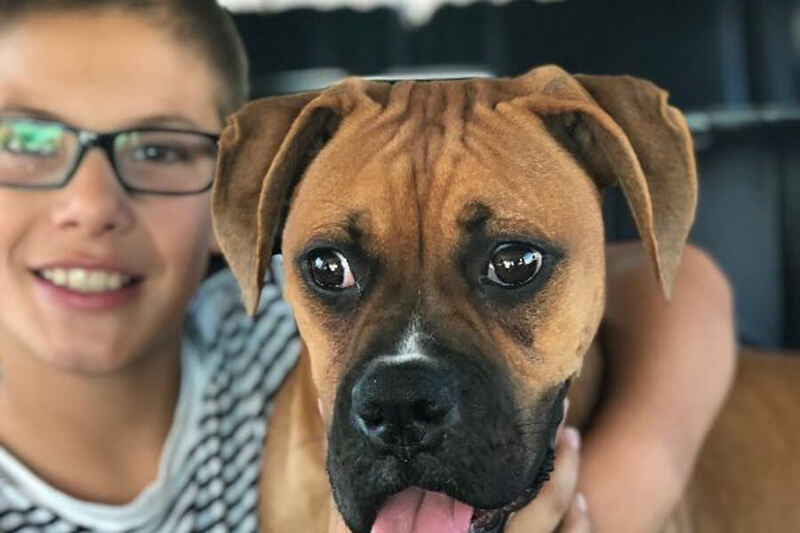 The family knew that Sasha was microchipped and hoped that she would end up in the hands of a veterinarian or an animal shelter. 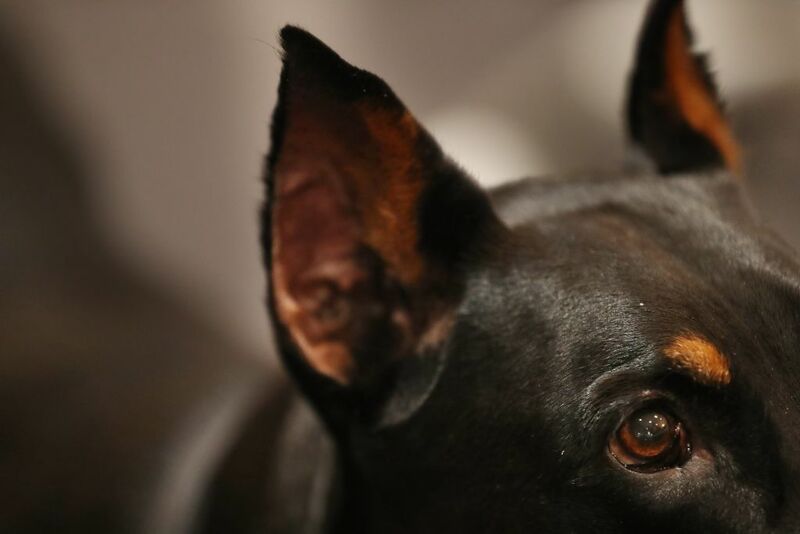 For the most part, almost all veterinary clinics or animal care facilities have the kind of technology necessary to read chips that have been implanted in pets. So, if Sasha ended up in some kind of animal facility, they would be able to read the chip and determine who she belonged to and would hopefully be returned. Knowing that this was a possibility filled the family with the hope that Sasha would eventually be returned to them. The family was still devastated about Sasha and decided to take matters into their own hands. 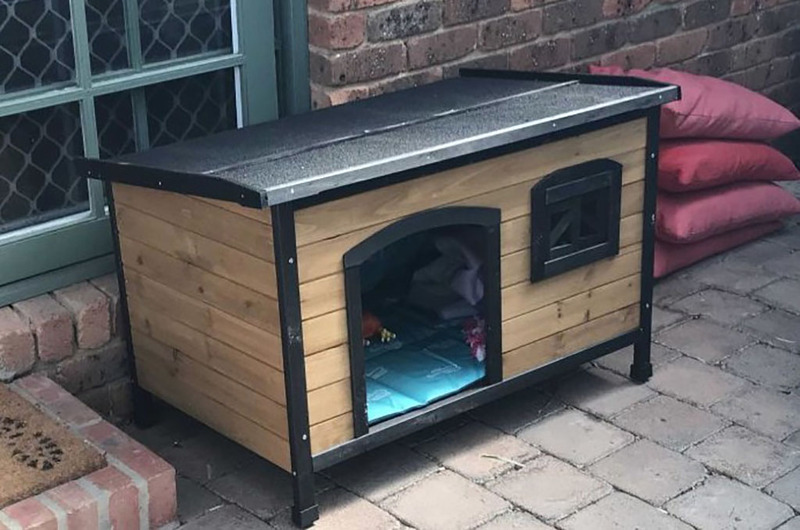 Their house felt empty without their little puppy and they couldn’t stand it anymore. 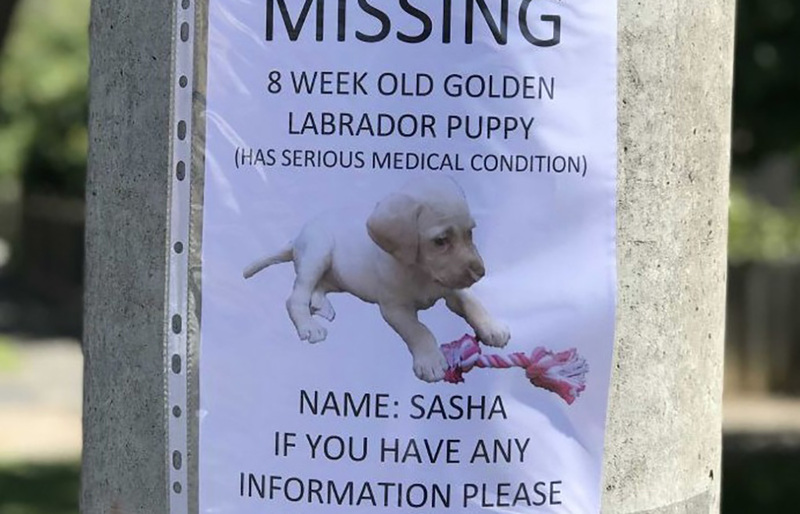 So, they made a public announcement that if their Sasha wasn’t safely returned to them the criminals would risk being located if the microchip was scanned. While most people know that the microchip doesn’t work as a GPS, the family thought that it might be worth a try to act like it was. The family also used social media to their advantage. They posted their story to spread awareness about their stolen puppy hoping that somebody would have some information. This turned out to be a huge help, as local news stations picked up the story as well and shared it with the community at large. This meant that people were keeping their eye out for the missing puppy which probably scared the burglars a fair amount as well. At this point, the burglars were most likely regretting taking Sasha from the family. 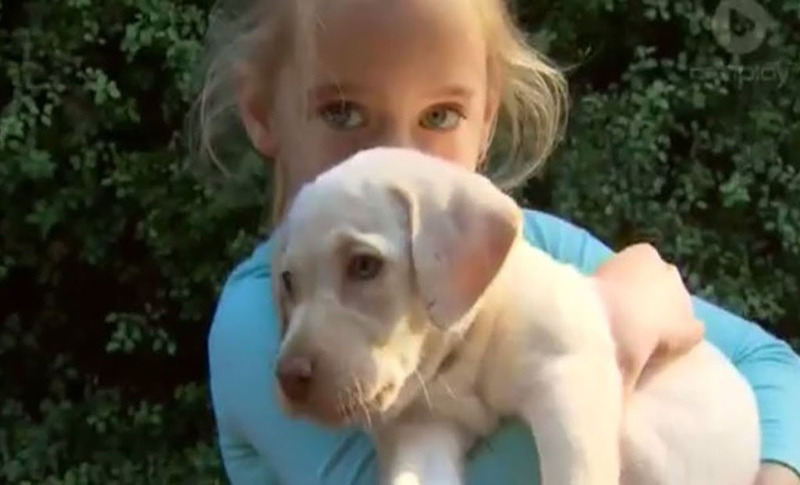 People were appalled that somebody would be so terrible as to steal a puppy and wanted to help bring her home. 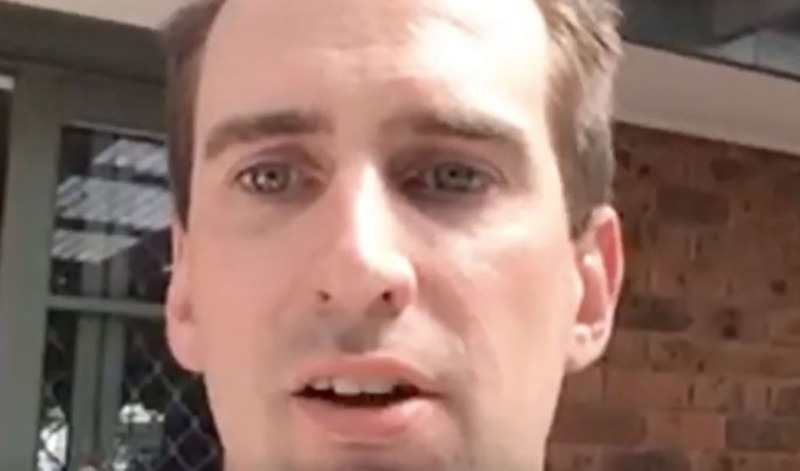 Even the Victoria Police got involved with the case and shared the family’s story on their social media. Sasha’s disappearance was the subject of news outlets everywhere as everyone wanted to see her return home. Since there was no guarantee that the puppy would be returned safely, all the family could do was anxiously wait. Little did they know what was about to happen. Although the family hadn’t given up hope, every day without Sasha made the situation more and more unbearable. But then, something incredible happened. 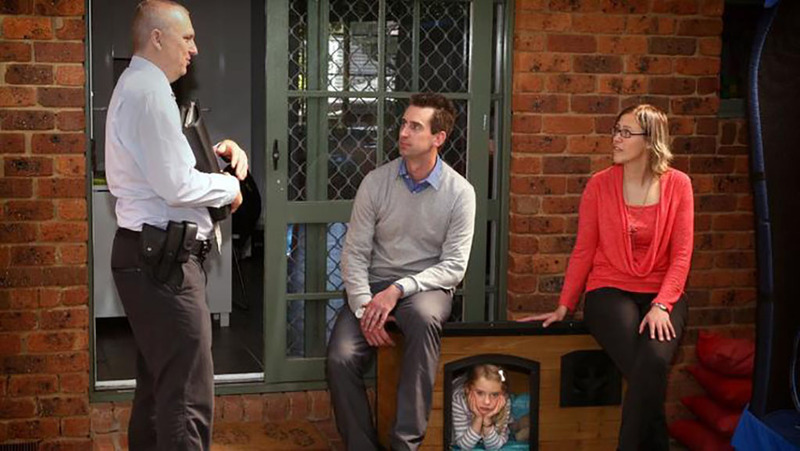 Speaking to the news, Ryan said: “We didn’t want to get our hopes up […] And then this morning, my wife got up to make herself a coffee and walked past the sliding door, and noticed there was a figure moving in the kennel.” Sasha had been secretly returned in the middle of the night! Ryan continued, “We think that whoever took her has either had a conscience or got scared and dropped her over the fence […] We don’t care, to be honest, we’re just glad to have her back. While giving the puppy back doesn’t absolve the burglars from their crimes, they did at least one right thing in the end. The whole family was rejoicing over the return of their beloved puppy, but nobody was as happy as Maia to have her friend back. 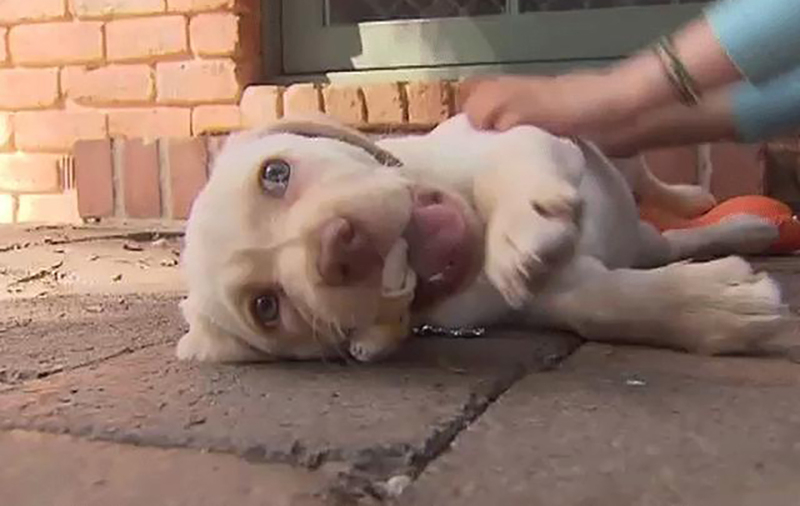 It’s stories like this that remind us just how precious our pets are to us. 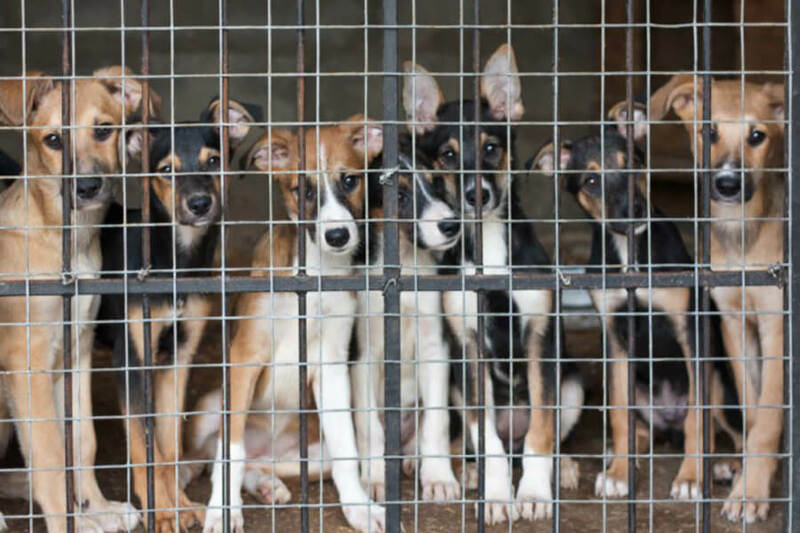 We would do anything to protect them, and they would do the same for us! 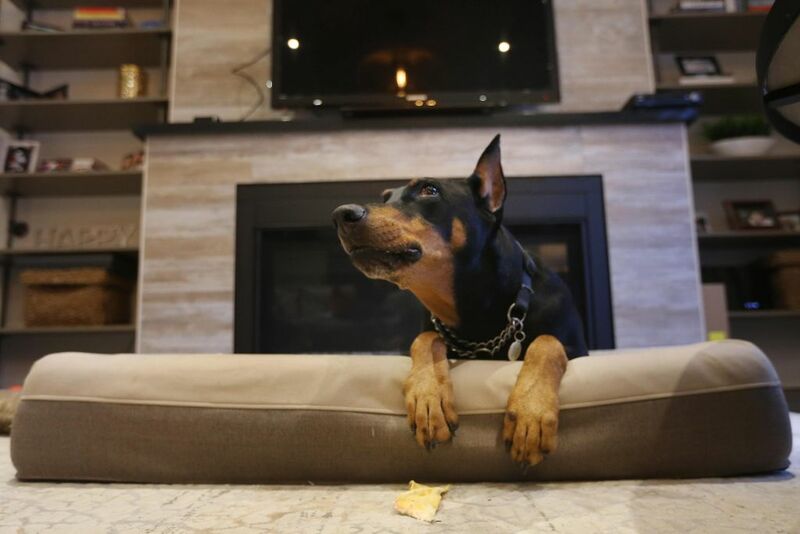 If you like Sasha’s story, you’ll love Khan — an incredible dog who saved a baby’s life. 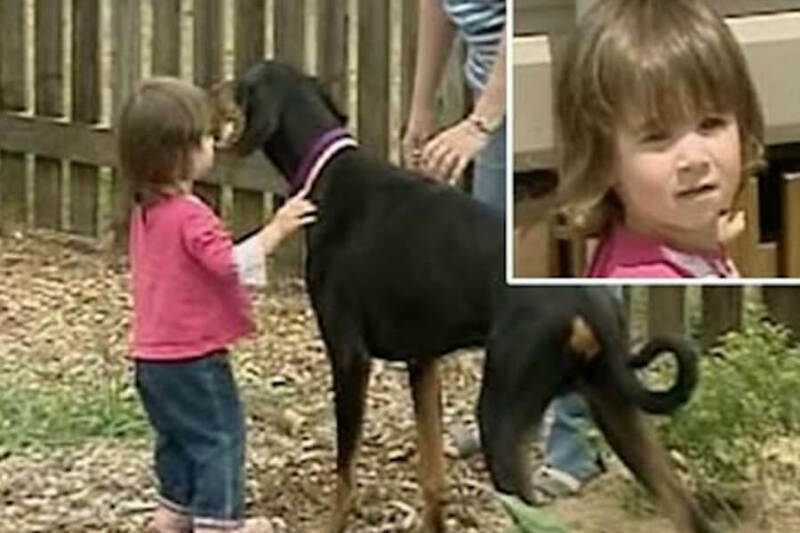 Family Dog Saves Baby’s Life, But From What? Nothing is more precious than the relationship between a child and their dog. 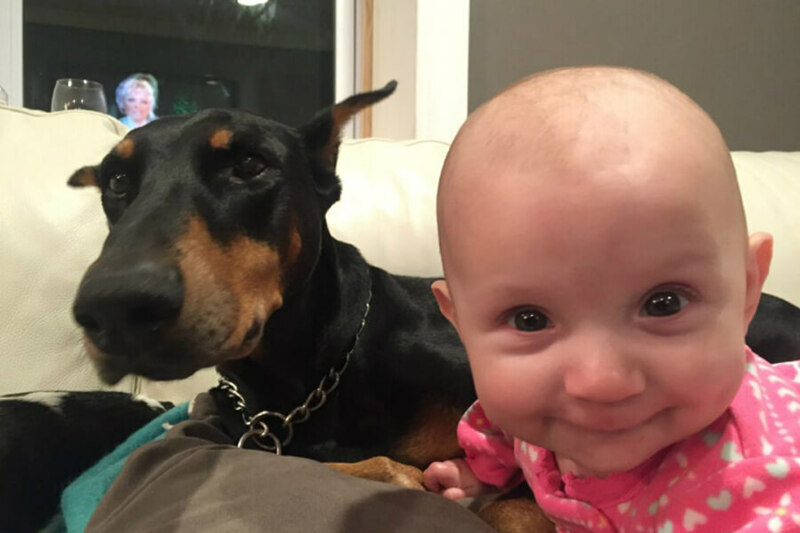 When this dog noticed his infant companion was in grave danger, he acted fast. Much to the horror of those watching, his rescue attempt looked like a vicious attack. The infant’s mother was horrified and felt helpless as she watched from the kitchen. Of course, she thought her dog was trying to kill her baby. When she learned the truth, she could not have been more relieved. When you learn the truth, your heart with fill with all the feelings! Keep reading to learn how Khan’s heroic act almost ended his life! We’ll also meet some other amazing life-saving dogs later on. 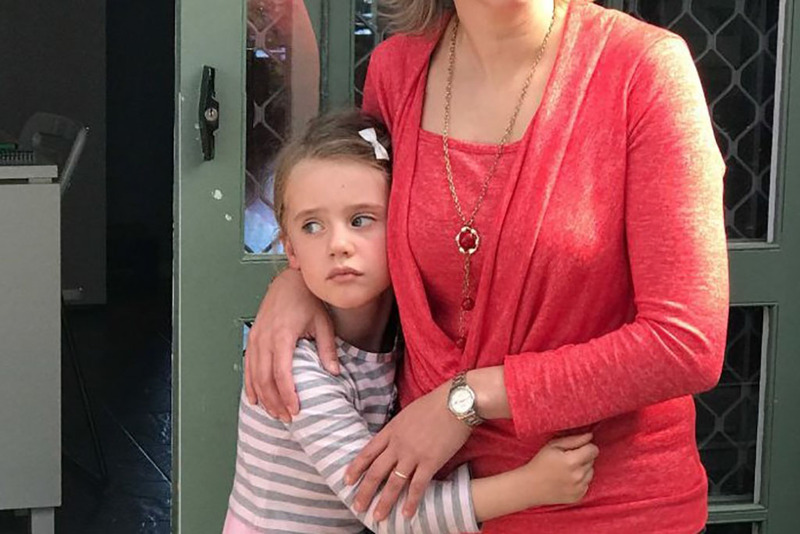 When Catherine Svillicic gave birth to her first daughter Charlotte, she wasn’t sure if she wanted more kids. 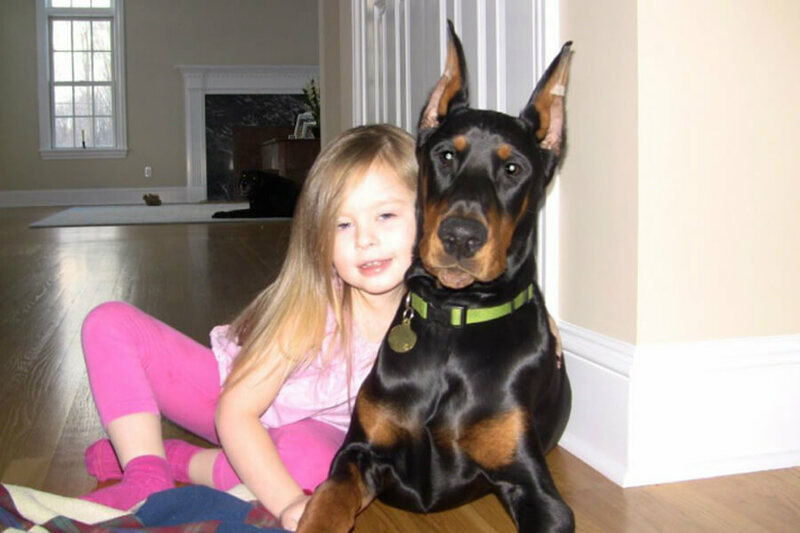 To make sure Charlotte did not grow up alone, she adopted Khan, a Doberman who was rescued from an abusive home. 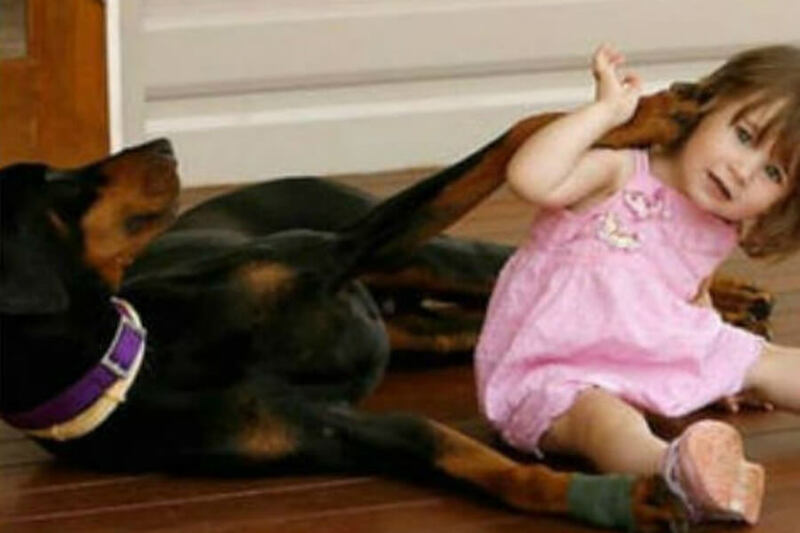 Despite a warning that Dobermans tend to be a violent breed, Catherine had a good feeling about Khan. It helped that the large dog was scheduled to be put down in a few days. At the time, Catherine had no idea that Khan would repay her for saving his life shortly. The decision to adopt a dog turned out to be an easy one for Catherine. 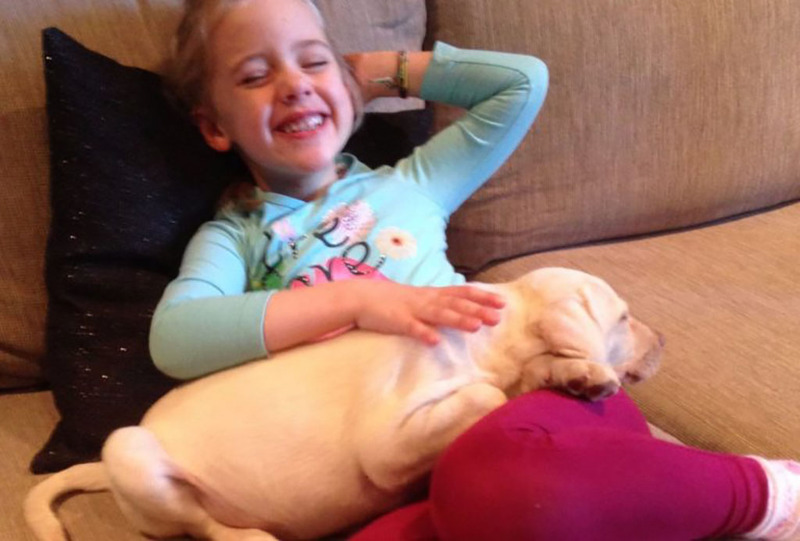 She grew up with a dog and knew she wanted Charlotte to have that same companionship. The loving mother also knew she wasn’t planning to have another child. The tough decision came when she had to decide what kind of dog to adopt. Catherine knew it was important to get Charlotte a companion that was good with children. 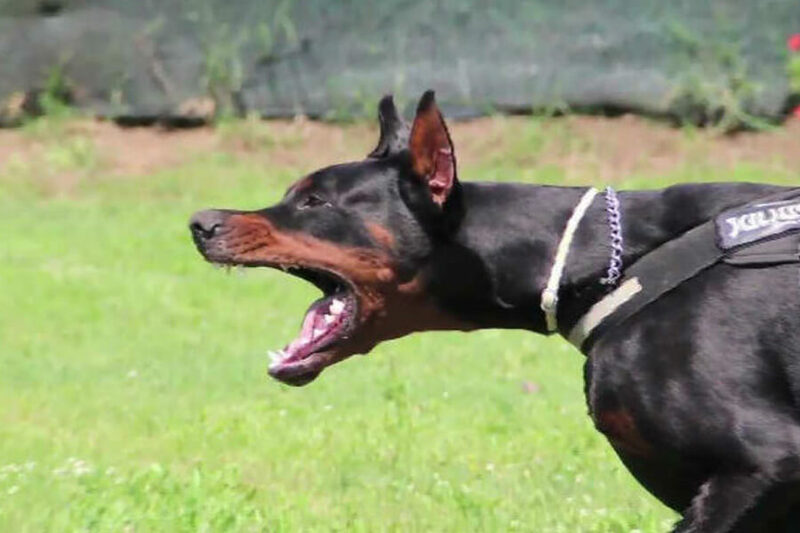 Dobermans like Khan don’t have reputations as family-friendly dogs. So why did Catherine throw caution to the wind and adopt him? You’ll have to go to the next slide to find out! 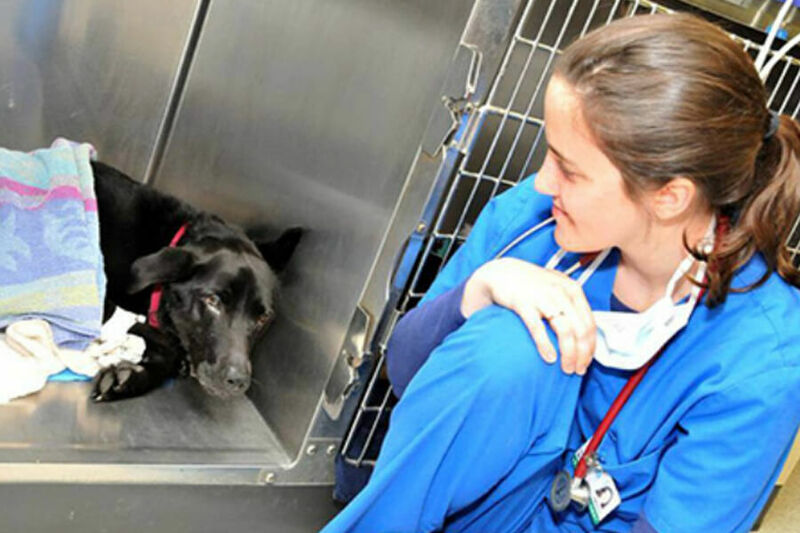 When Catherine saw Khan at the animal shelter, it was love at first sight. She knew the reputation of Dobermans, but there was something about Khan she knew was different. When she talked to the shelter, they told her the dog had an abusive past and was scheduled to be put down the following week. Against everyone’s warnings, Catherine made her decision and saved Khan’s life. Somehow, someway, Khan must have known he’d been saved. When he arrived at his new home, everything seemed right with the world. Catherine was slow to introduce Khan to Charlotte. She knew the big dog needed to be introduced to her toddler slowly. Once the bond was formed, however, the pair was inseparable! Khan followed Charlotte around the house with a loving eye. He frolicked with her in the backyard and even slept with her. He was her bodyguard, which made what happened next even more shocking. Catherine had no idea what to think, all she remembered was what the shelter had told her about Khan’s past. When Khan arrived at the animal shelter, he was incredibly malnourished. The shelter rescued him from a life of abuse and neglect. 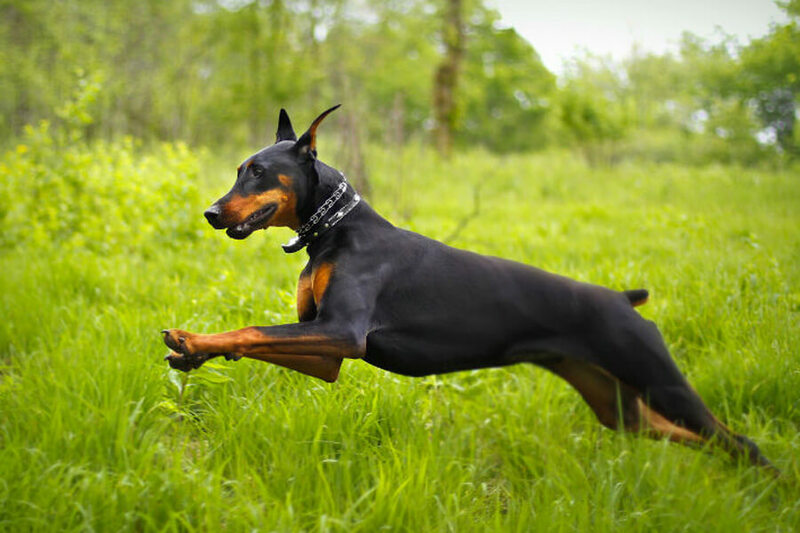 A purebred Doberman, he was raised by a breeder and sold to the worst home possible. Besides being malnourished, Khan’s body was badly injured. He had broken ribs and clear signs of abuse. Some in the shelter felt the best life for the dog would be no life at all. They warned Catherine that Khan could lash out at any time and wouldn’t be safe around a baby. The life-shaking incident occurred with Catherine watching from the kitchen, helpless to do anything. Khan and Charlotte were in the backyard when the dog began nudging the toddler. Charlotte ignored him until he knocked her over, picked her up by the diaper, and thrashed her around. Horrified, Catherine ran outside as fast as she could, but wasn’t fast enough. Khan flung Charlotte across the yard and howled. Amazingly, just when it looked like Khan proved the doubters right, he couldn’t have proved them more wrong. Up next, what really happened in the backyard. As it turned out, Charlotte was just fine, and Khan’s horrifying howl was actually a painful yelp. After tossing Charlotte to safety, he hobbled up to Catherine and collapsed. Confused and in shock, Catherine somehow managed to find her focus and act fast. Suddenly it wasn’t her toddler’s life that was in danger; it was her heroic dog’s. With adrenaline rushing through her, Catherine found the strength to get Khan into her and to the vet. Once there, saving Khan’s life became a race against the clock. Pulling into the vet, Khan received help right away. The doctor found bite marks just above his right front paw. 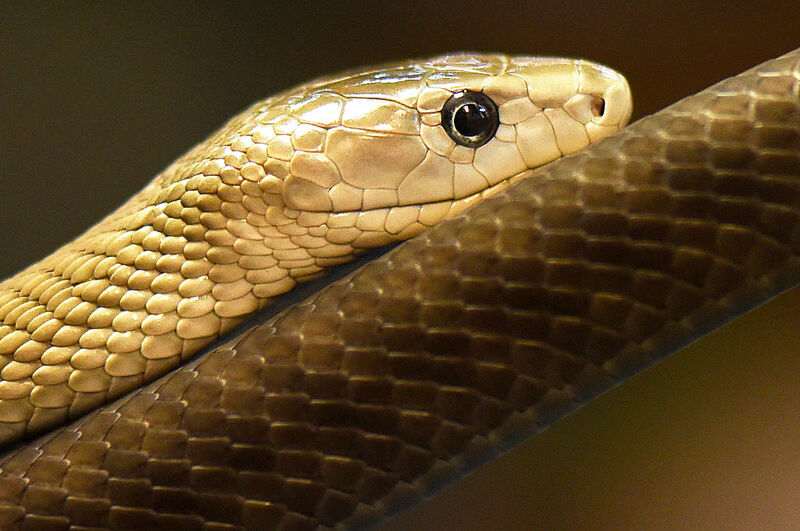 Khan had been bitten by a venomous snake. More than that, Khan had saved Charlotte from being bitten by a venomous snake. Now he laid paralyzed and near death. The vet pumped Khan full of anti-venom. At this point, there was nothing anyone could do but wait. The truth is, depending on when Catherine got Khan to the vet’s office, it may have been too late to save his life. Keep reading to learn what kind of snake bit Khan. As Khan and Charlotte played in the backyard, they had no idea a venomous mulga snake was hiding in the bushes. 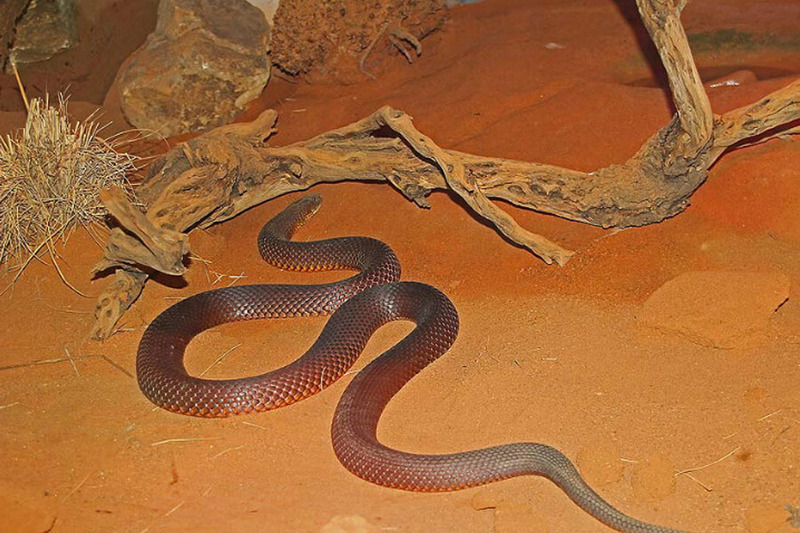 The mulga snake is more commonly known as the king brown snake, one of the deadliest snakes in the world. Charlotte and Khan were playing in the backyard when Khan saw the snake. Sensing danger, he tried to let Charlotte know to move. His first attempt was to nudge her. She didn’t get the hint so, he kept nudging her until she fell down. At this point he acted fast, grabbing her by the diaper and tossing her out of the way. From Catherine’s perspective, this was one of the scariest sights of her life. From Khan’s perspective, he was doing the only thing he knew how to save the family that saved him. With Charlotte safe, Khan took a vicious strike from the mulga, possibly trading his life for Charlotte’s. Up next, Khan fights for his life at the vet. Catherine sped through traffic and made it to the vet’s office in record time to save Khan. Unfortunately, there were several factors out of her control once there. Had she gotten Khan there fast enough? How much venom had been injected into him? What kind of venom? How fast was the venom spreading? Khan had only been with the family for four days before the incident, but they already loved him like he’d been there for years. Luckily for them, Khan was a fighter. He survived a broken home and was given a second chance at life. He wasn’t about to give that up. So far we’ve talked about two possible endings; Khan survives to live a happy life, or he doesn’t. There is a third ending, though. Before Catherine left the vet, they let her know every possible outcome. One of these outcomes was Khan surviving, but being paralyzed for the rest of his life. Depending on how much venom went into Khan’s bloodstream, it might not have been enough to kill him. Weighing well over 100 pounds, there was always a chance Khan would survive the attack regardless. So, which ending did Khan get? The Svicillics waited with Khan at the vet’s until closing. They were told there was nothing more they could do. Khan was in for a long night at the vets. He had been given as much anti-venom and medicine as they could allow. Now it was up to him to produce enough antibodies in his blood to fight back. Charlotte and Catherine returned home and anxiously waited for the morning. Catherine has admitted that she didn’t sleep at all that night. She couldn’t bear the thought of losing Khan. Coming up, find out if Khan survived and what happened after. With no sleep the night before, Catherine drove Charlotte to the vet the next morning. They got there early and had to wait until the office open to find out if Khan survived the night. The vet let them inside and told them Khan had survived the night. Khan, as a matter of fact, was doing so well that he was already regaining his strength. He was expected to make a full recovery. The miraculous news meant that Charlotte would continue to grow up with her best friend and protector. Of course, this isn’t where our story ends. Khan may have entered the animal shelter in the worst shape of his life, but his lineage made sure he was strong enough to handle it. 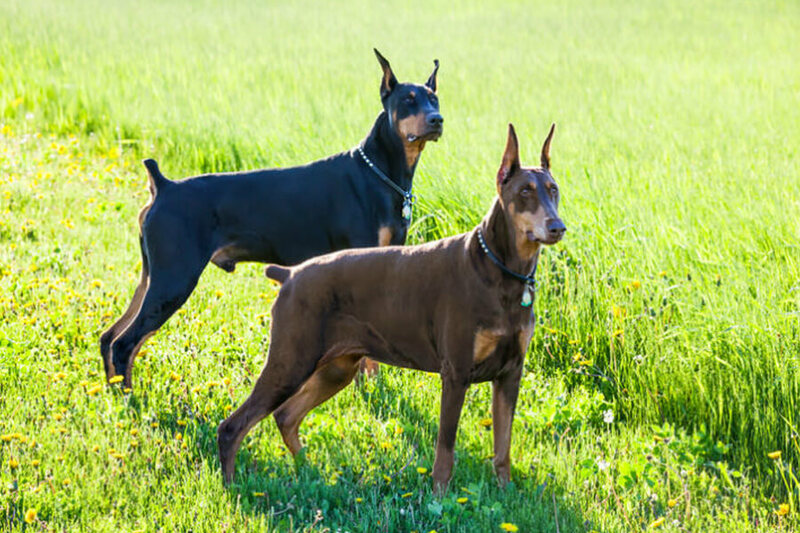 According to the shelter, Khan was bred from another heroic Doberman. His grandfather once saved a young child just like Charlotte! Khan had his name expanded after the incident to “Khan the Wonder Dog.” Wonder seems to run in his family. Thankfully he was able to get out of the abusive home and find the truly loving one he deserved. Next, Khan’s story goes viral! Khan’s attack turned rescue quickly became a media sensation around the world. The best part is, Khan has no idea he’s a celebrity! He’ll always see himself as Charlotte’s best friend. Catherine, however, knows Khan is admired worldwide. When a reporter asked her about his heroism, she said, “If Khan wants a gold bowl, Khan gets it. We owe him for the rest of his life.” Khan will live a long and full life with the Svicillics. Find out what they’re up to today, next! Khan and Charlotte are still best friends. It’s hard not to believe destiny chose them to grow up together. 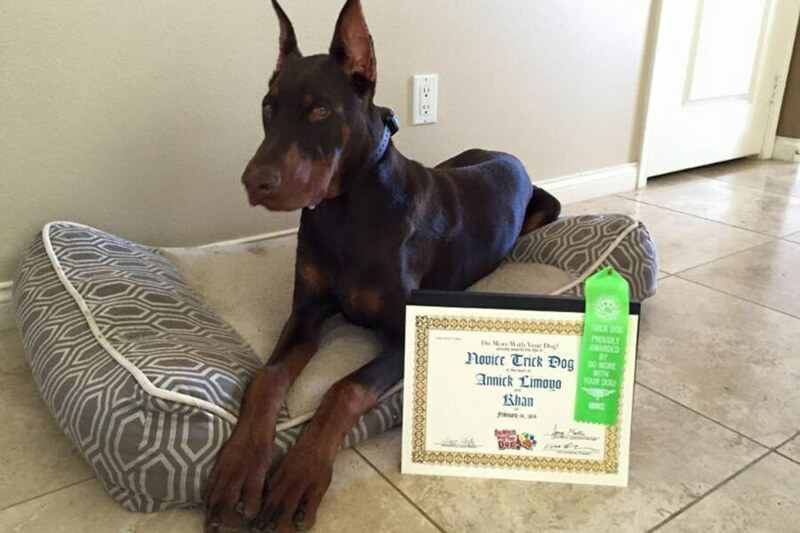 Hopefully, this story will help ease fears around “dangerous” dogs such as Dobermans. Khan is only violent when it comes to protecting those he loves. Khan isn’t the only heroic dog out there. 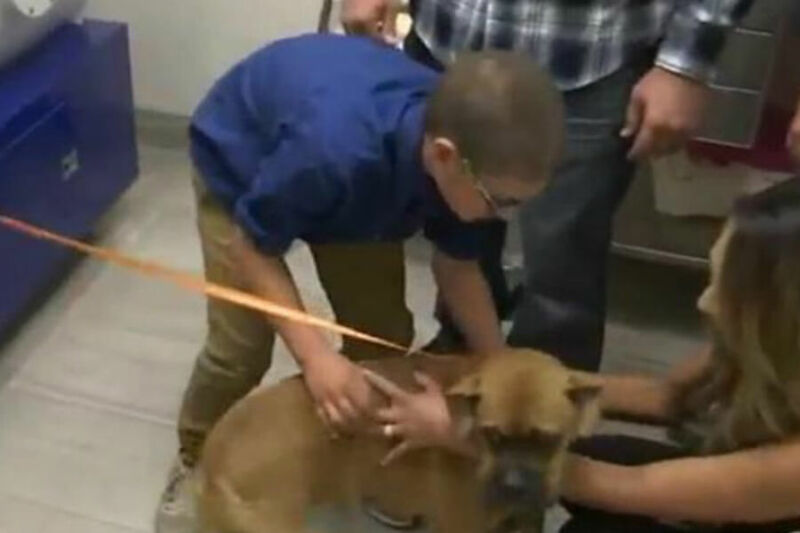 Another story that caught our attention about a heroic dog is Nala. She stood between her best friend and a green Mojave rattlesnake to save his life. Learn about their story, next! Cole Lewis and Nala had no idea what was waiting for them on a bike ride in Northern Californa one day. Out of nowhere a green Mojave rattlesnake jumped out of the brush and attacked! The first strike was a near miss; the second strike wouldn’t be so forgiving. Nala positioned herself between Cole and the attacker. The snake lunged again, biting Nala on the nose. Cole ran as fast as he could to find his stepdad, Anthony, and get help. The pair rushed Nala to the vet as quickly as possible. When asked about Nala’s heroic act by a reporter, Cole said, “She stood her ground. She didn’t whimper or anything when she got bit.” Cole’s stepdad was able to identify the snake, and a strong anti-venom was administered. Nala was considered to be in critical condition and the next several days would determine her fate. Nala was placed in a hyperbaric chamber for the first 24 hours while the anti-venom took effect. To be able to afford the treatment, the Cole and Anthony had to start a Go Fund Me page to raise extra funds. As you’re about to see, their efforts were worth it! Waiting for days to find out the fate of a pet can be excruciating. When the vet finally called the Cole to let him know Nala was okay, he was overjoyed. Nala was even more overjoyed and jumped all over her best friend. When they took Nala back home, Anthony said, “We got her from a rescue. 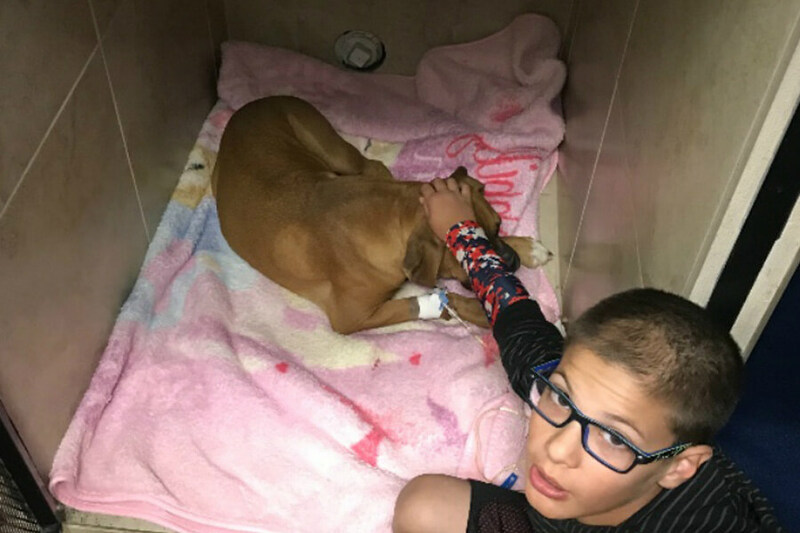 We rescued her, and she rescued us.” Since the incident, Cole has created a Facebook page warning people to be careful on trails and always be on the lookout for possible dangers to avoid.